We’re on a wine discovery vacation in Spain, and so there have been a lot of posts about Spanish wine lately. 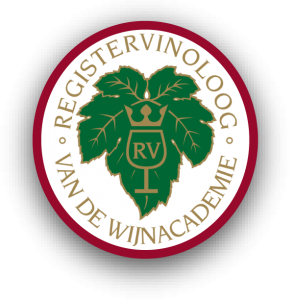 Although I do intend to write more about wine than I used to, this will remain primarily a cooking blog. And so it is about time to post a recipe again. 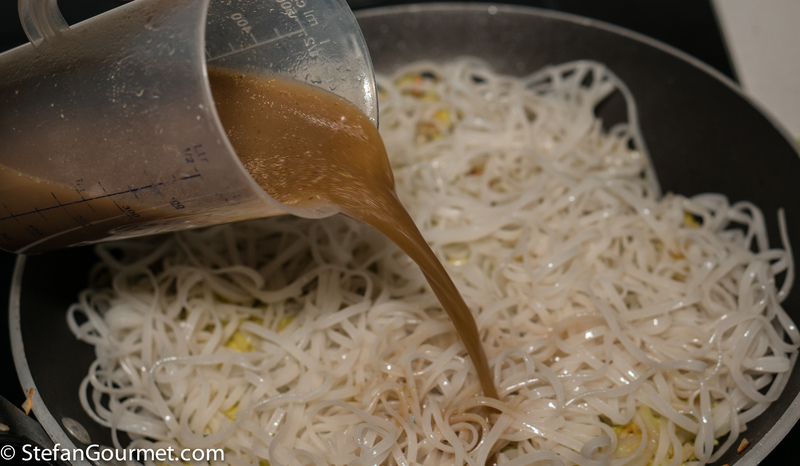 I prepared and photographed this Asian-inspired dish before we left. 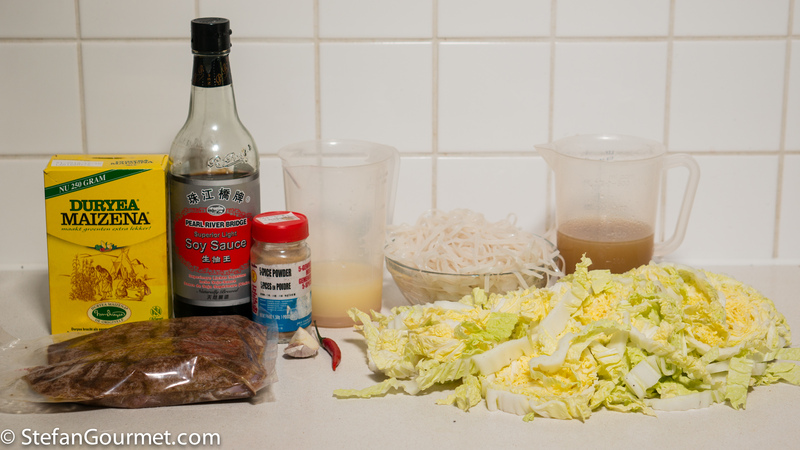 The combination of five-spice with duck and napa cabbage (Chinese cabbage) worked very well. The post still had to be written, so you can see I am still working during my vacation. 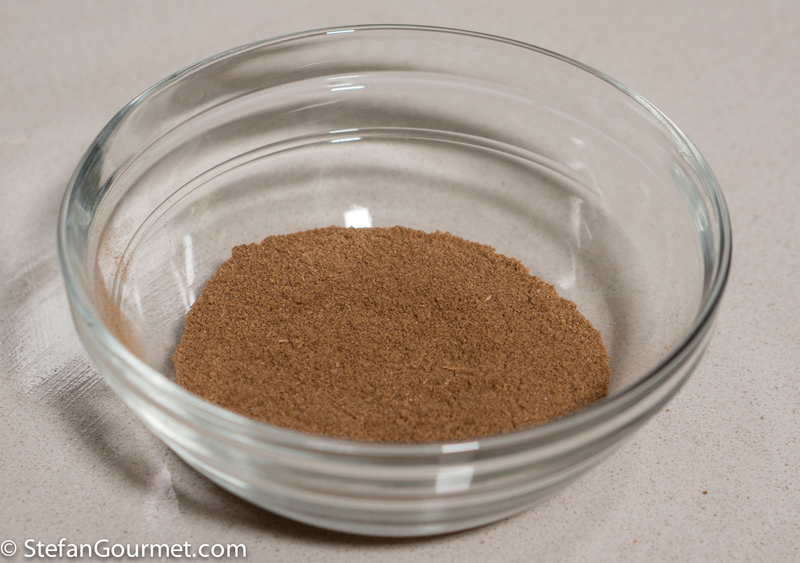 Five-spice is a spice mixture that originates in China. You can buy it in Asian markets, but you can also make it yourself. 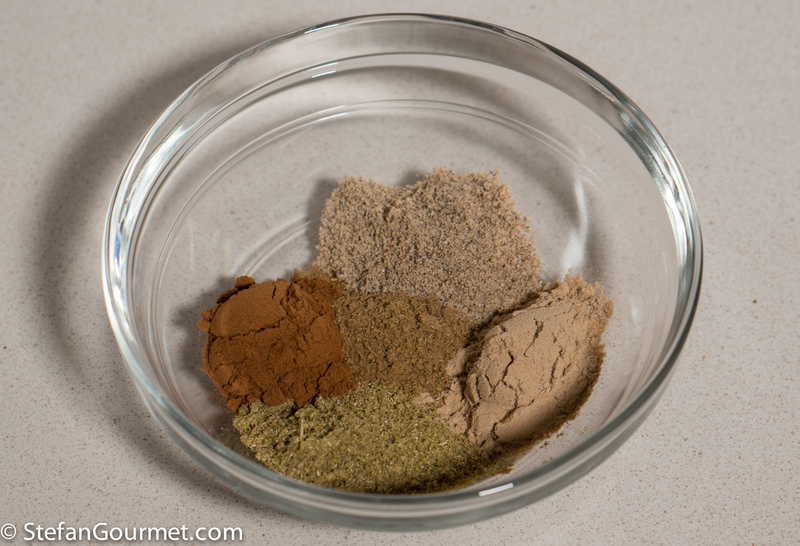 As the name implies, it is a mixture of five different spices. That seems to be the main rule, as there are many variations. They are usually mixed in equal quantities, but I would recommend to go easy on the pepper as well as the cloves (if using), as otherwise they could overpower the dish. Five-spice works well with duck and pork. In this case I used it for duck. Since a whole duck was the same price as just the duck breasts, I decided to get the whole duck and make stock for a sauce from the carcass, as well as using the duck legs for another preparation (recipe to follow). 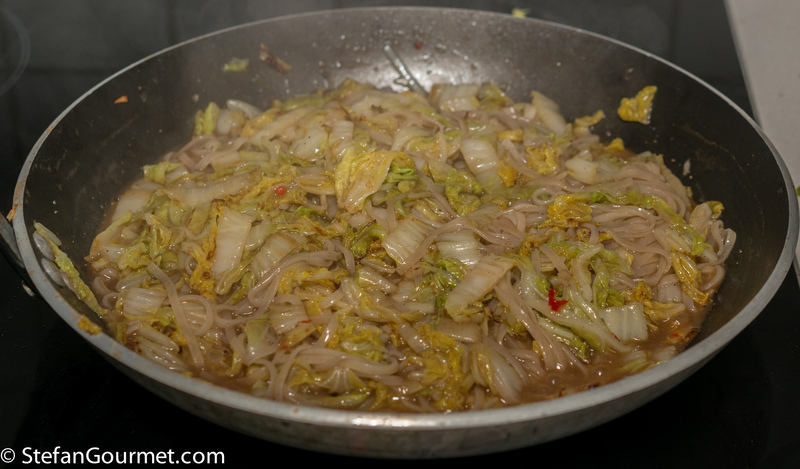 I also rendered the fat from the duck skin to stir-fry the cabbage. All of this to maximize the duckiness of the dish, and the result was great and certainly worth repeating. 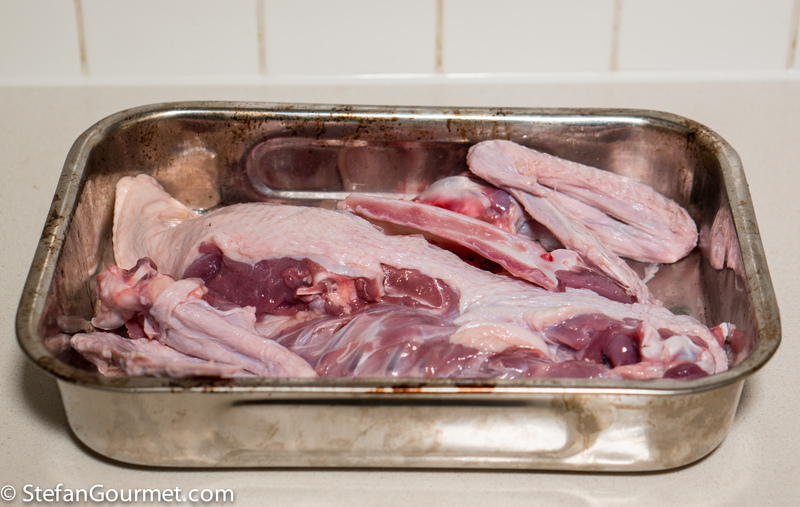 Separate the duck into breasts, legs, and carcass (or ask your butcher to do this for you). Preheat the oven to 190C/375F. 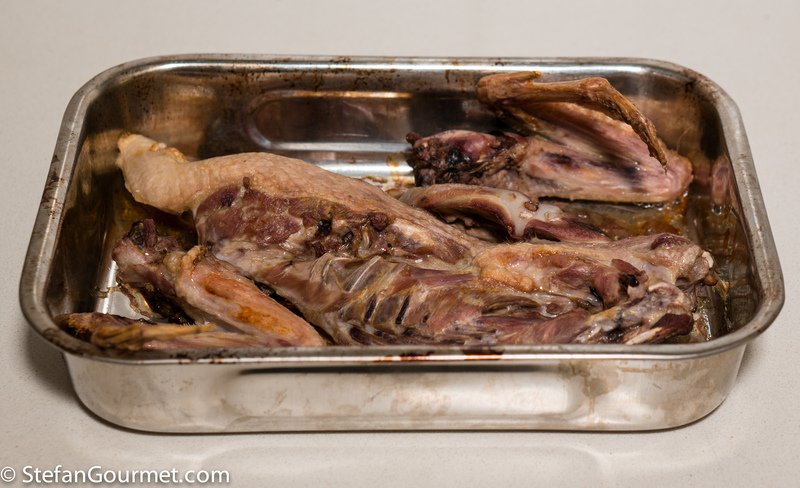 Put the duck carcass (including the wings) in roasting tray. Roast the duck carcass for half an hour at 190C/375F. This browning step will give the duck stock a deeper flavor. 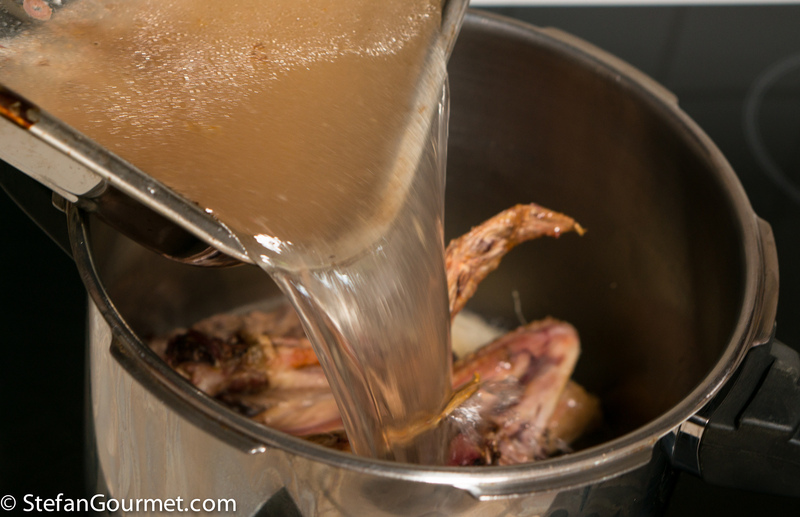 Transfer the roasted duck carcass to a pressure cooker or stock pot. 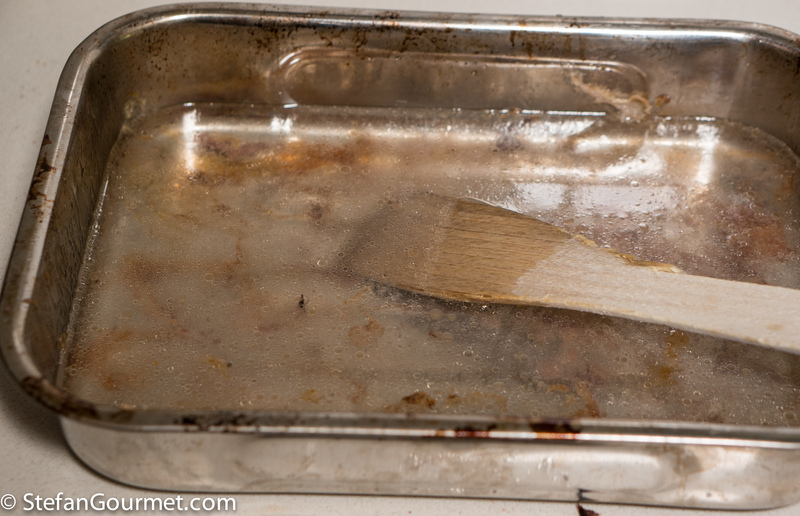 Add a litre (4 cups) of water to the roasting tray, and use a wooden spatula to loosen any browned bits that are stuck to the roasting tray to include all the flavor in the stock. 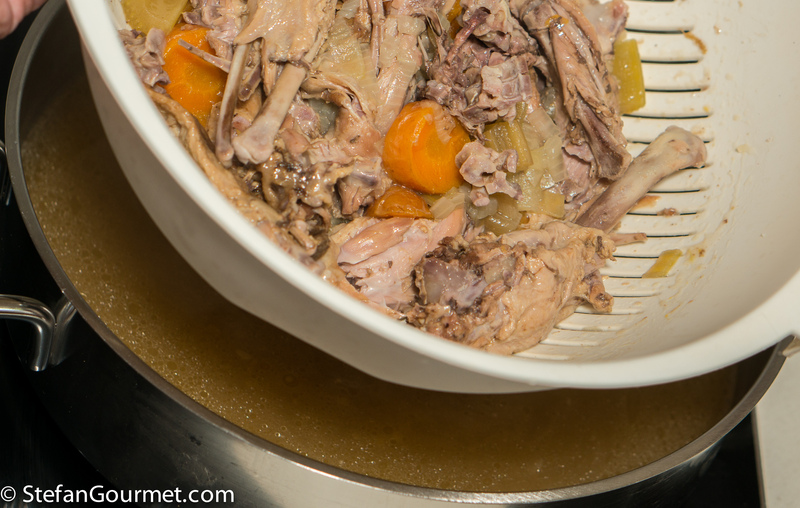 Pour the water from the roasting tray into the pressure cooker or stock pot. Add a chopped onion, a chopped carrot, a chopped stick of celery, and a bay leaf. Add more water if needed to barely cover. Pressure cook for 2 hours or bring to a boil and simmer for 4 hours. 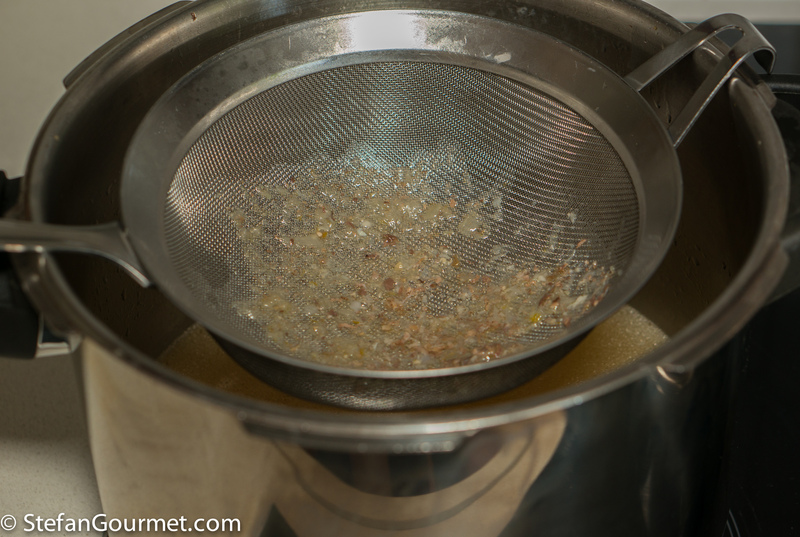 …and then with a fine sieve to get a clear stock. 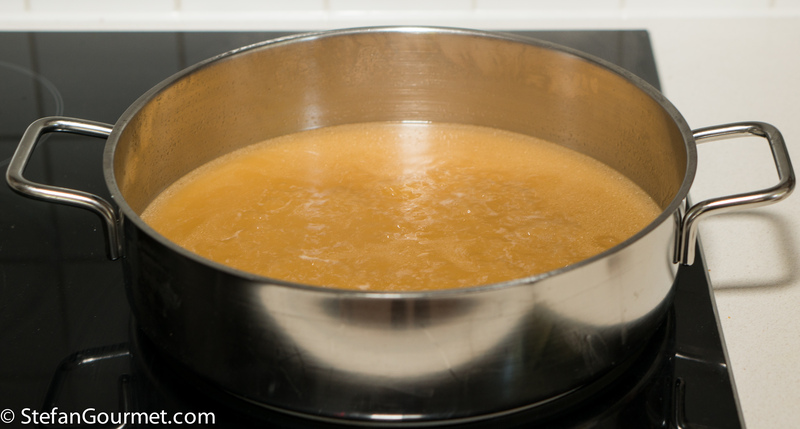 Bring the stock to a boil in a wide pan and then reduce to simmer. 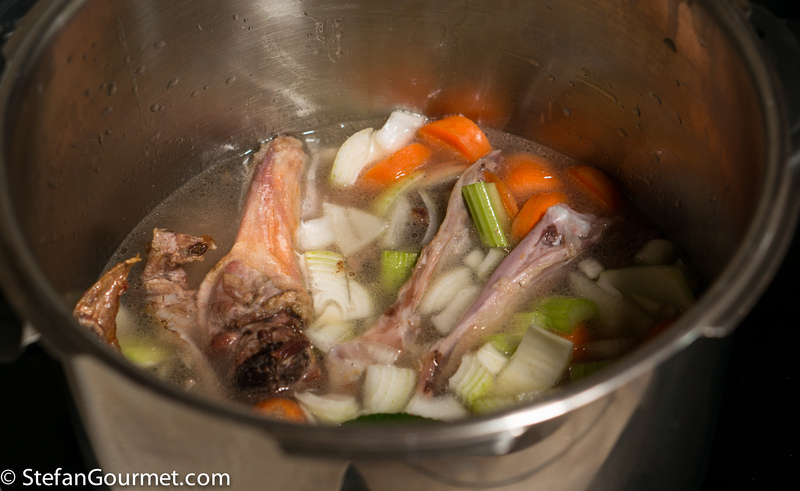 Simmer until reduced by half, yielding about half a litre (2 cups) of concentrated duck stock. You only need half for this recipe, so freeze the rest to use for a sauce with the legs. 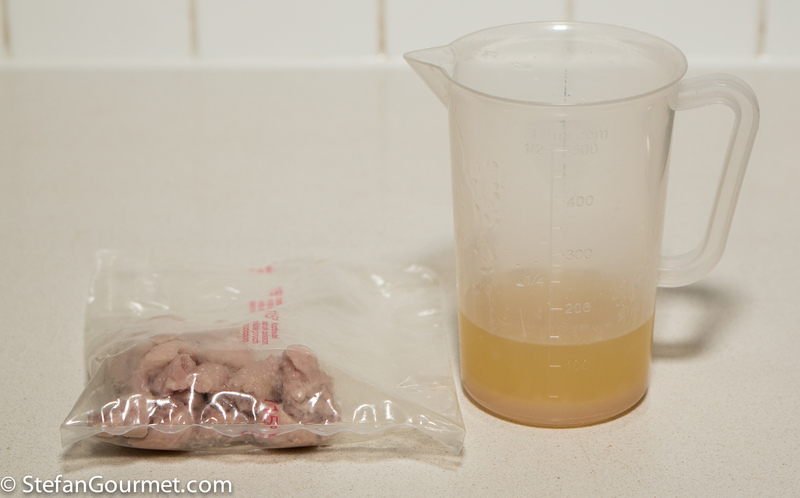 An easy way to render the fat from the duck skin is to vacuum seal it and then simmer in water that is almost boiling for an hour or so (or cook sous-vide at 90C/190F). The fat will render from the skin without any browning. Strain the duck fat. You won’t need all for this recipe, so refrigerate the rest and keep it to roast potatoes. …and stir until it looks homogeneous. Store in an airtight container. Score the skin of the duck breasts in a diamond pattern. 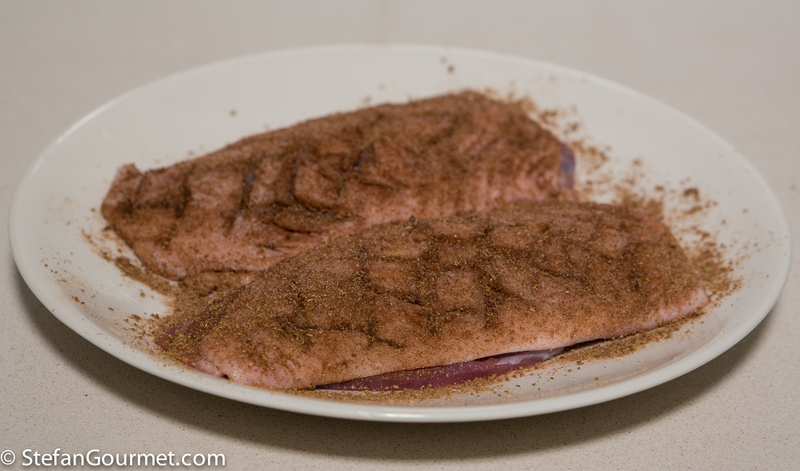 Season the duck breasts with a teaspoon of five-spice and 1/4 teaspoon of salt per side (so for 2 duck breasts altogether 4 tsp of five-spice and 1 tsp of salt), and rub in the salt and spices. 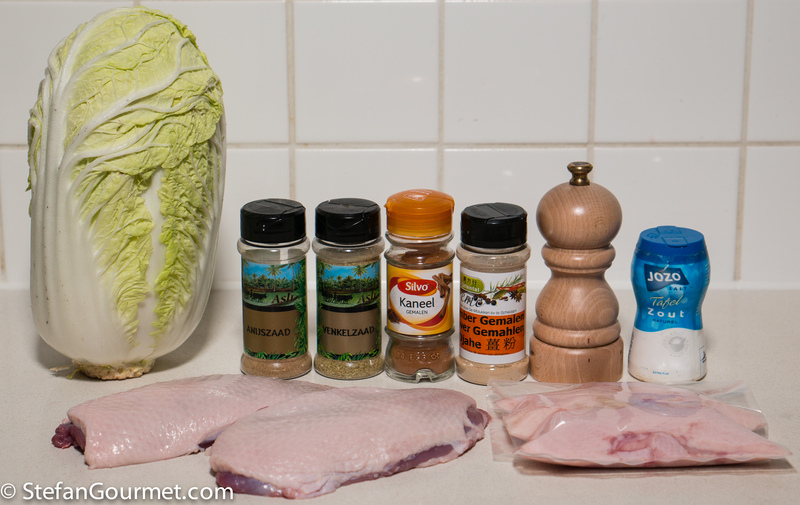 Vacuum seal the duck breasts and cook them sous-vide for 2 to 4 hours at 55C/131F. 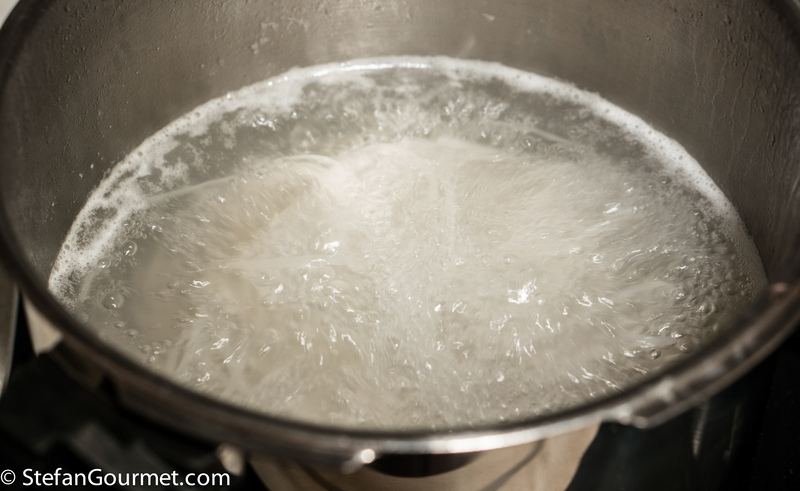 Boil the rice noodles for 1 minute, then drain them and rinse with cold water. 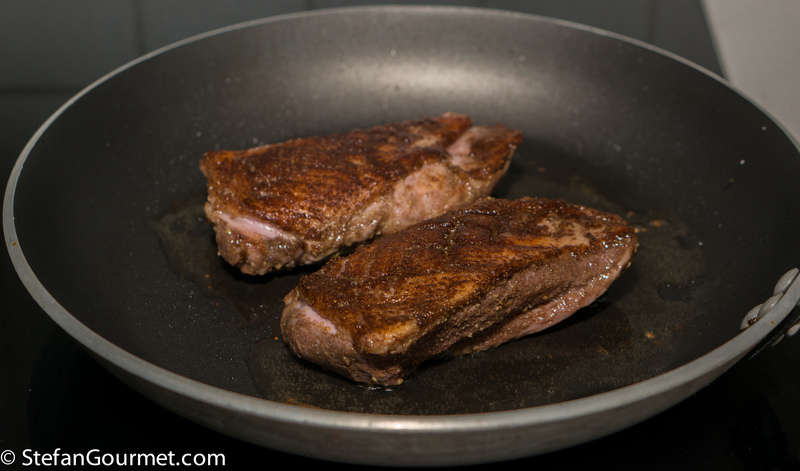 When the duck breasts have been cooked sous-vide, take them out of the bag and sear them in a dry frying pan, skin side down, over high heat until the skin is nicely browned (about 3 minutes). Turn over and brown the other side briefly in the fat that rendered from the skin, about 1 minute. 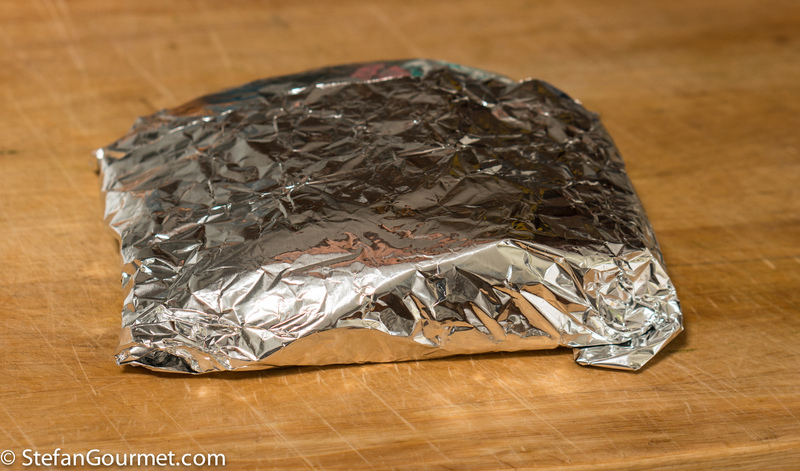 Wrap the duck breast in aluminum foil and allow to rest while you finish the dish. As the duck was cooked to 55C/131F, the carry over heat from the searing will bring it nicely to medium. 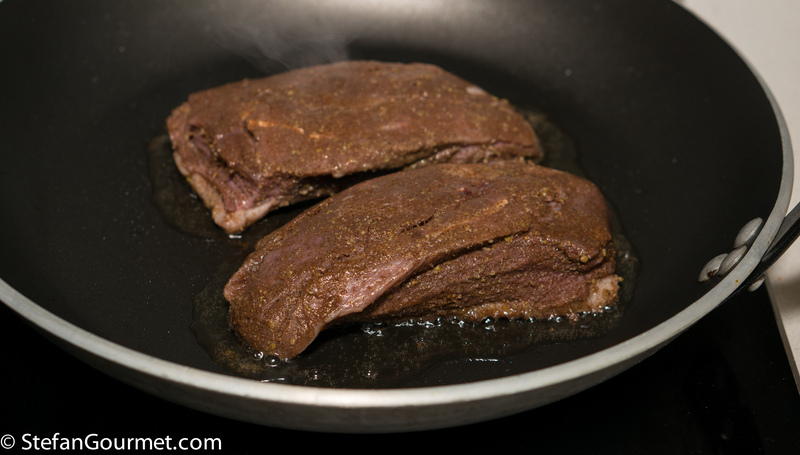 Heat 2 tablespoons of duck fat in a wok or frying pan. 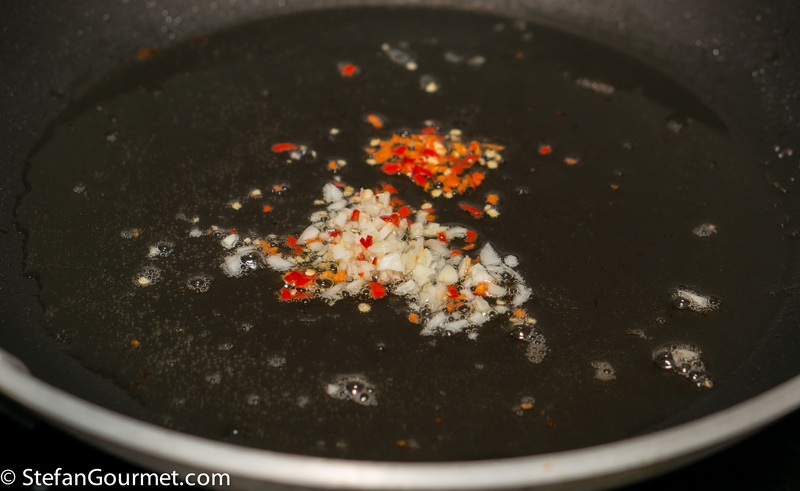 Add a minced red chilli, and a minced clove of garlic, and stir for 30 seconds. Stir-fry until the napa cabbage is tender but still firm to the bite. 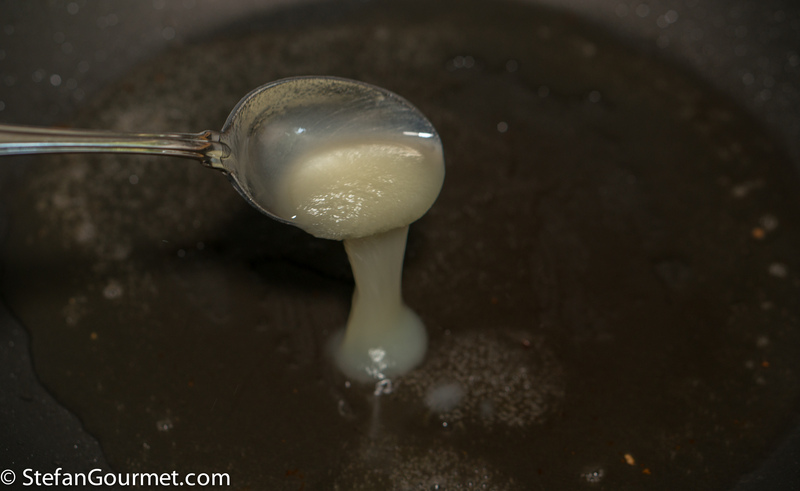 Mix 250 ml (1 cup) of concentrated duck stock with 1 Tbsp soy sauce, 2 tsp corn starch, and 2 tsp five-spice powder. 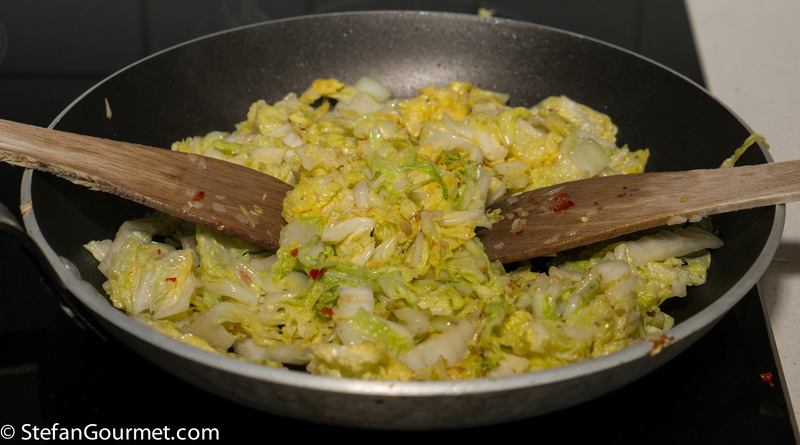 Add this mixture to the cabbage, together with the parboiled noodles. Bring to a boil and stir until the sauce thickens, about a minute. Taste and adjust the seasoning with salt. 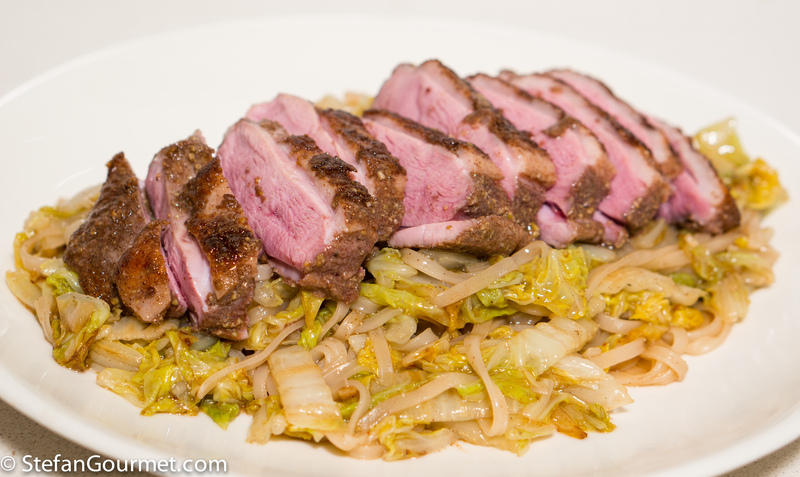 Slice the duck and serve it over the cabbage and noodles. The five-spice requires an aromatic wine that doesn’t have a lot of tannins. A Zweigelt from Austria would be an excellent choice. 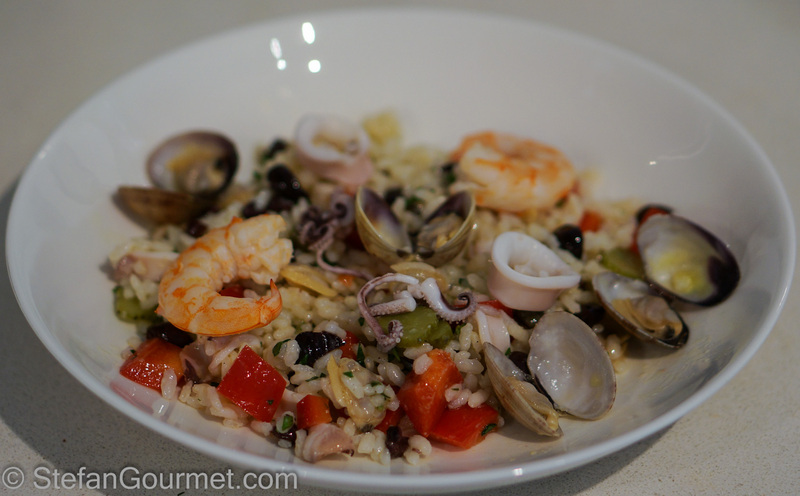 If it is still as summery where you are as it is currently in the Netherlands (or here in Spain), this seafood rice salad would be an excellent choice for a dish. You could also bring it on a picnic or to a potluck. 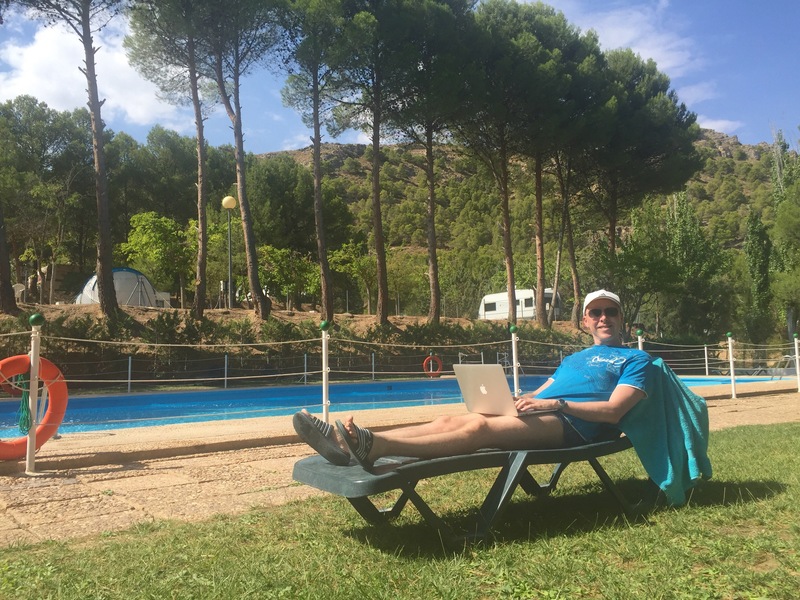 It is a good way to blog while lying on a lounge chair in the sun. 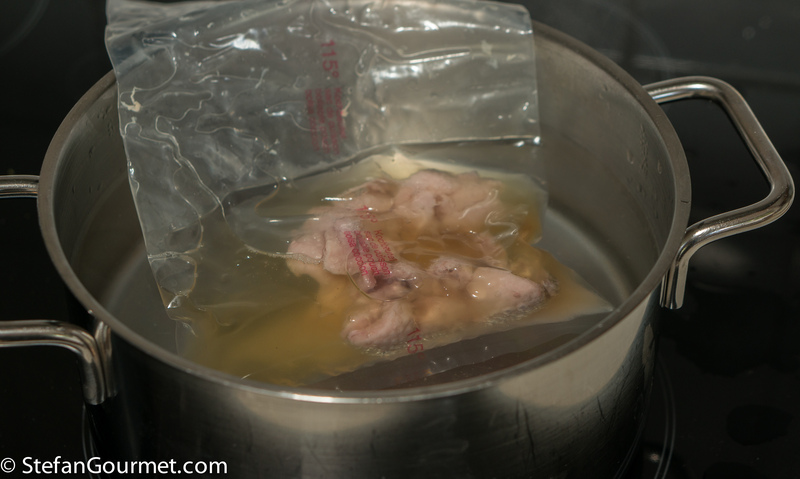 Great idea to simmer the skin in a vacuum seal. Have you tried to grill the skin afterwards? I love everything about this dish! Wish I could taste it. Hope the RV gets fixed and you two don’t lose your jobs! Thanks, Mimi. The replacement RV will arrive tomorrow. 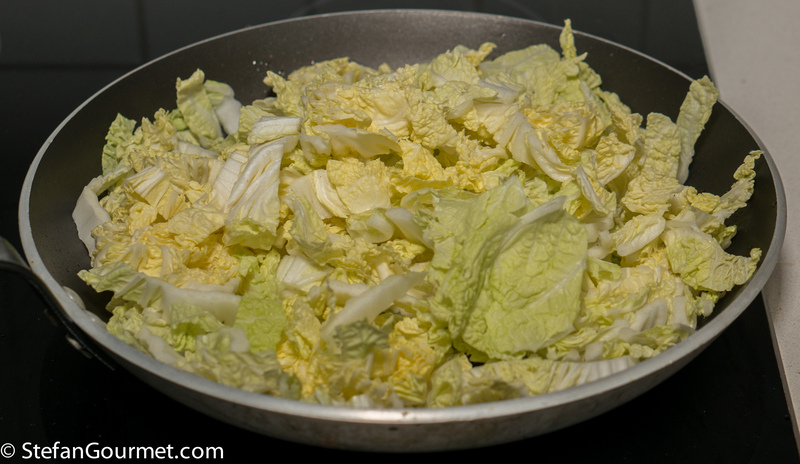 How “Chinese cabbage’ and ‘Napa cabbage’ denote the same vegetable is beyond me trying to u’stand, but this surely is a delicious dish!! Well, I have ‘Chinese cabbage’ in my crisper!!! Have always bought my ‘5-spice’: use an awful lot of it!! Looking around my small library just perchance your ‘working position’ is somewhat enviable 🙂 ! We truly would not mind more of the same . . .
I’m so far behind that by now you may well be home. Wherever you may be at the moment, I hope you thoughly enjoy(ed) Spain. This dish sounds wonderful, Stefan. Duck and 5 Spice go so well together. Before I make my own spice blends, I go to a spice shop where I can buy small quantities of those required. It’s far too wasteful otherwise but I’m loathe to buy pre-made blends. At least I know exactly what I’m using. Continued safe travels. Yup, we’re back! Check out on FB how much wine we brought 😉 Thanks John, always appreciate your comments.